Note for returning players: Even if you're a returning player who's already in the list, you still officially have to sign up here according to CC tourney rules. Use that chance to confirm your home-court settings for the season. Welcome to my favorite tournament — the 2012-13 installment of the NCAA College Baseball season (this marks our sixth year). 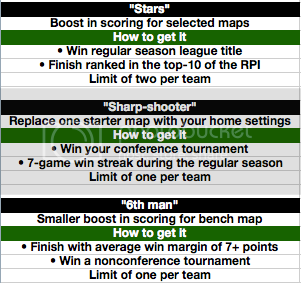 ELIGIBILITY: Open to all players, although I ask freebies to keep pace with the flow of the tourney — six maps per week. If you start falling behind I will go to the reserves list at my discretion. 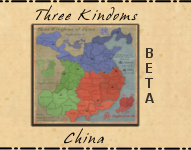 HOME MAPS: Sequential order is required…the rest is up to you. DEADLINE: Registration will close Tuesday, Nov. 6. 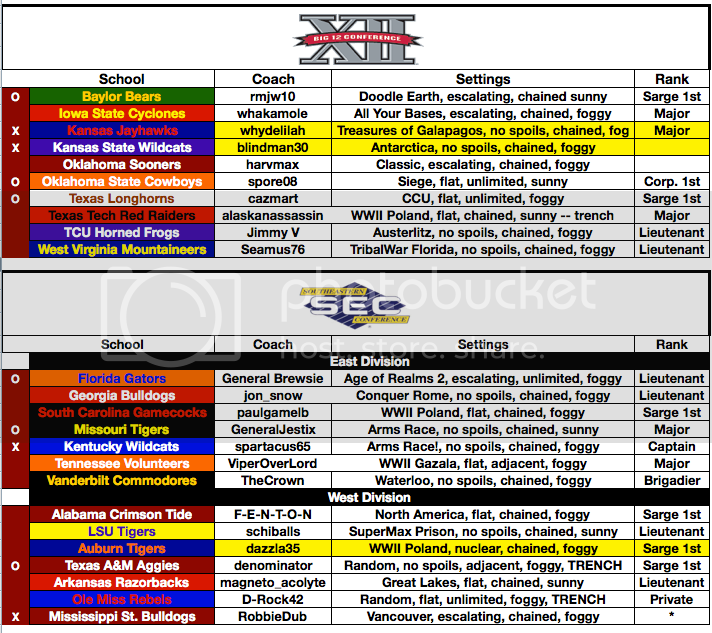 TEAMS: This is set up to take in 182 teams, however that number is fluid. I am willing to add more leagues if there is the demand or we may shrink that number if leagues don’t fill entirely. NEW TWIST: The only change for this season, is that coaches can now be fired at the end of the season!!! You must finish at .500 or better to get a chance to reserve your same school for next season. All other coaches will have to fight it out for their choice when the next season’s sign-ups go public. REGULAR SEASON: We will have a 30-game regular-season schedule, which will follow along with the real NCAA schedule as closely as possible. Some required tweaks to the schedule don’t allow an exact replica. Also, some teams may sneak in more games based on regular-season tournament results. • Scoring is based on a three-map system (see box below). Teams that win 2 of 3 will usually come out on top, but it is possible to win once and take the game if you win quickly and lose long battles. This allows us to post realistic basketball scores and track scoring stats for the teams. All maps are played on the home team’s settings. If the game is tied, an overtime map will be used. MARCH MADNESS: At the end of the regular season, a tournament committee will select the 68-team field for the March Madness playoff bracket. Automatic bids are awarded to the winners of each conference tournament, so you can finish last during the regular season and still have a shot at the Big Dance with a run at the end of the year. The tourney will start with four “play-in” games, which will comprise the last eight teams selected to make the field. The March Madness phase of the tournament will be played under an eight-map format with each map representing a different player — 5 starters and 3 bench players. These are played on preset maps (see list below) to replicate the neutral-court environment of the NCAA bracket. POWER UPS: Teams earn “power-ups” for their tournament teams by accomplishing various tasks during the regular season. CHAMPION AND PRIZES — The winner of this March Madness tournament is the winner of our Conquer Club event and will receive 1-year premium. The runner-up will get 6-months premium and the other two players that reach the Final Four will get 3-months premium. NIT TOURNEY — We will also hold a consolation 32-team NIT tournament. It will follow along with the regular season format through the early rounds before adopting the March Madness format once it heads to Madison Square Garden for the semifinals. No prizes for this consolation tourney…this is simply for fun and bragging rights. 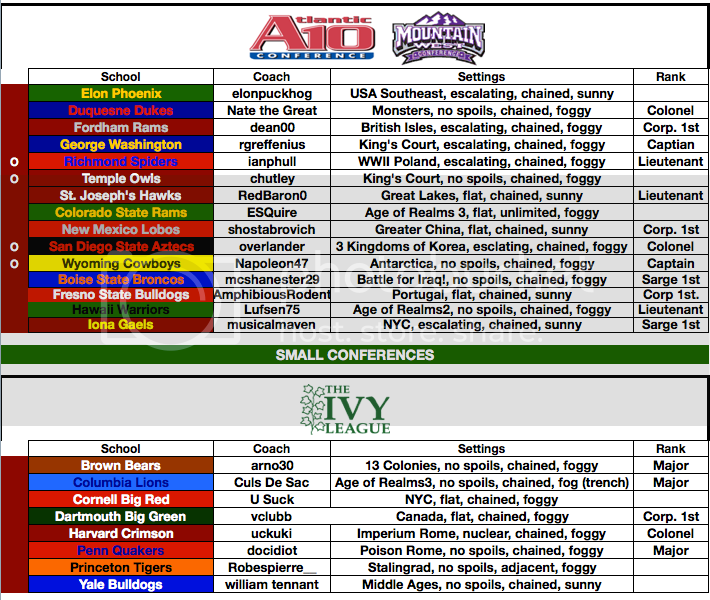 SIGN-UPS — The current list has 15 total leagues (172 schools)…6 power conference, 6 mid-majors and 3 small conferences (see images below). 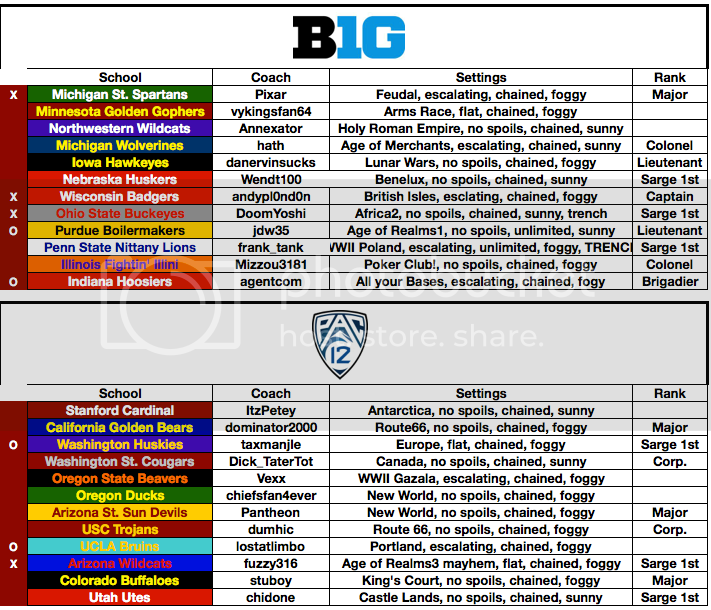 If you don’t see your school on the list, I may be willing to add it into a hybrid league — I do ask that only Division I basketball schools make the list. 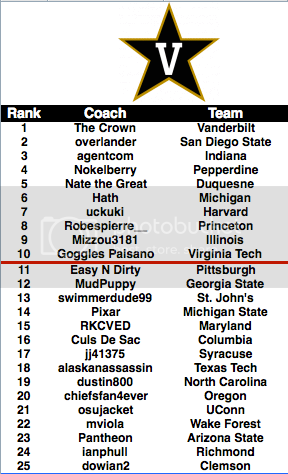 You will also notice some teams with a “X” — these are elite programs that require players of “Captain” rank or higher, you’ll also notice some schools with an “O” these are perennial powers that require “Lieutenant” rank or higher…the remaining schools are open regardless of CC rank. I will close signups on Tuesday, Nov. 6…after that we will fill a reserves list — these players often get a chance with an event of this size. 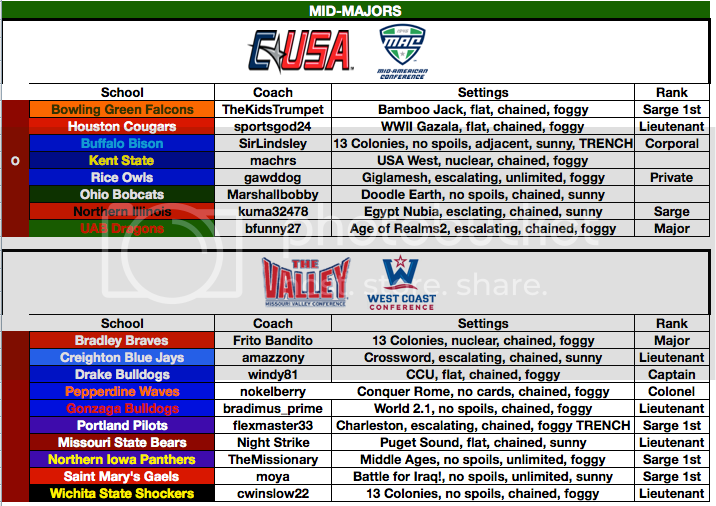 When selecting a team please include your home court settings…map, forts, spoils & fog/sunny (sequential order is required). Any questions, post them in the thread, so they can be answered for everyone. 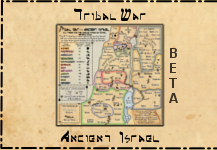 Check the team list link below – I’ll try to update the list each night until the close of sign-ups. Players in Red are returning players from last season. If your settings are grey or blank it means you need to confirm them. If they are Red you are good to go. Last edited by flexmaster33 on Tue Nov 13, 2012 10:55 am, edited 12 times in total. I'd be willing to be a "bottom feeder" team if the SoCon was represented. As it is, I think I'm out. Impressive tourney, though. elonpuckhog wrote: I'd be willing to be a "bottom feeder" team if the SoCon was represented. As it is, I think I'm out. Impressive tourney, though. 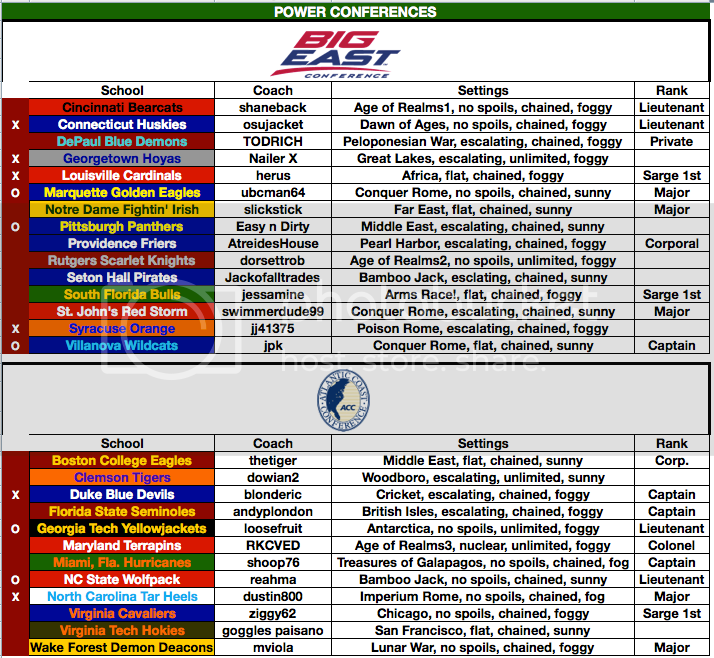 If you have a lower-tier school you want to represent let me know...I'll often have to make hybrid leagues out of a couple small-conferences or I can make an 8-10 team league that has a mismatch of small schools from across the country. I'd like to represent my alma mater the ELON PHOENIX! USA Southeast, esc, chained, sunny. Thanks flexmaster. It should be noted that even if you're a returning player who's already in the list, you still officially have to sign up here according to CC tourney rules. Use that chance to confirm your home-court settings for the season. Sweet. I'm not running the football tourney this year, so I can play from the beginning. Also, you should take Benzorrr off the list as Boston University as he's quitting CC. Confirming my spot with texas tech, but I'd like to switch my map to Trench Warfare with the settings of chained, sunny, and flat rate. Thanks flex. Love your tourney's as always! Just when I thought I was out, Flex finds a way to pull me back in. After an eventful offseason in which he may or may not have been the one who stole 30,000 gallons of maple syrup from Quebec's strategic maple syrup reserves, Coach Ricrem returns to the floor for another zany year of college hoops. When asked how in the world Vermont didn't give him the axe after a subpar season last year, Ricrem noted that he can be very persuasive at times (as his eyes shifted away from a somewhat conspicuous looking tanker truck parked outside the gym.) "We've got some new guys, and I'm thinking that my study of Harlem Globetrotter films is finally going to pay off this year." noted Ricrem. 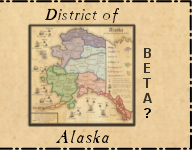 I'll go with the old standard, Vermont with Canada as my map, flat rate spoils, fog and chained reinforcements. I've heard that twice about benzorrr now...will take note. Sent him a pm this morning, as he's in a bunch of my tourneys. thanks for the heads up...better to deal with that now than 2 weeks into the tourney. Confirming Clemson. Map/Settings look good. Go Tigers! Back in with South Carolina. Going to go with WWII Poland as my map this time, flat, chain, fog. Last edited by paulgamelb on Thu Oct 25, 2012 2:19 pm, edited 1 time in total. The Champion Duquesne Dukes will return! After last season's thrilling championship run, Coach Nate was resigned to a long-term contract & the Dukes had their best recruiting class in their history. The program also received many donations, which helped in the construction of a new arena. Their home court will now be as follows! Good luck to all this season & another big thanks to Flex for running one of the best tourneys on the site! I would like to change my map to Conquer Rome, foggy, chained, no spoils.